The T4G reunion tour was back in Louisville, complete with C.J. Mahaney. The gospelly-centered celebrity leaders, Al Mohler, Mark Dever, Ligon Duncan, and C.J. Mahaney make up a powerful team. Reminiscent of the young teenage girls who caught a glimpse of the Beatles, the T4G fanboys were going ga-ga at the sight of their idols and the scent of new books! Tripping over themselves to nab a prized front row seat, any pretense of “preferring one another in love” was out the window, as were several other Christian virtues, but more of that later. The 2016 Together For the Gospel conference has come to a close. Judging by worldly standards, it was a rousing success. 10,000 gospelly-centered men filled the KFC arena in Louisville to worship their favorite Christian celebrities, and occasionally Jesus Christ; be led in singing by Mahaney’s right-hand man, Bob Kauflin (who continues to remind us he is not a cessationist by screaming out an ill-advised YES! in the middle of a hymn), live Tweet thousands of ridiculous sound bites from their home-boys (like this pearl of wisdom from Matt Chandler – “Okay, we’ll let you live.” Paul: “Fine, to live is Christ.”), and add boatloads of books to their libraries. No word on how much cash each of the celebrities pictured above walked away from the conference with, but I’m sure it made a nice deposit in each of their gospelly-centered bank accounts. Following what can only be characterized as a bizarre introduction in which Al Mohler, C.J. Mahaney’s $215,000 personal public relations man, attempted to justify why he and his celebrity buddies allowed Mahaney, a man credibly charged with leading a conspiracy to cover-up the sexual abuse of children in his denomination, a prominent role in the conference. Mahaney took to the stage! He cracked open his CrosswayTM ESV Bible (available in the T4G bookstore during the break) to the book of Job. Mahaney, who fancies himself a modern-day Job, delivered the very words of God (his description of the Word preached) to his adoring fans. My takeaway was that although covering up sexual abuse in your denomination may drive nearly half of the churches out of the denomination, thousands of members from the church, some perhaps never to return, and untold suffering for the families and victims of abuse, this all pales in comparison to what Mahaney had to endure in his season of suffering. But if one is humble enough to apply the message from Job, ultimately he will be drawn closer to the Savior and the Savior will graciously, in His kindness, restore you to the gospelly-centered celebrity club! 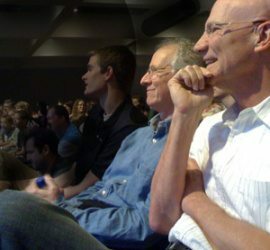 The T4G gospelly-centered celebrity club, in a brazenly “in-your-face” display, allowed two other top leaders from the Sovereign Grace denomination to hold out a break-out session, the purpose of which was to recruit other churches to join the Sovereign Grace Churches denomination! 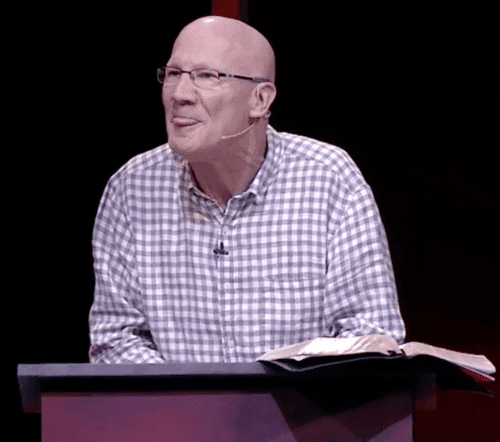 Mohlers introduction wasn’t just intended to bring Mahaney to the microphone…it sent two other messages. The first message was to the protestors outside the building and online. That message was that these leaders do not care about either the protests or the victims they represent. Evidently, the “tenth mark of a healthy church” is that the leaders have no conscience. The second message was to those inside the hall…the 8000 from all over the world who came together under these leaders. That message was that Mahaney is one of our own and you will accept him as one of your leaders. They willingly acceded to the tyranny in hopes of being a tyrant one day themselves or lest their current tyranny be exposed and they need powerful friends. This…is the modern template of what it means to be a “Reformed pastor”. Richard Baxter and Jesus wept together. This brings up an interesting point. Please watch the short video below. 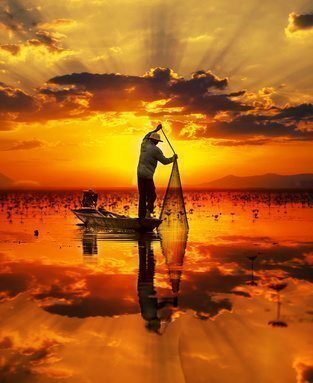 But someone may well say, “You have faith and I have works; show me your faith without the works, and I will show you my faith by my works.” You believe that God is one. You do well; the demons also believe, and shudder. But are you willing to recognize, you foolish fellow, that faith without works is useless? Tuesday, outside of the KFC Yum! Center was a small group of protesters. This group consisted of some who had been sexually abused and some parents, former members of Mahaney’s church, whose daughter had been sexually abused. 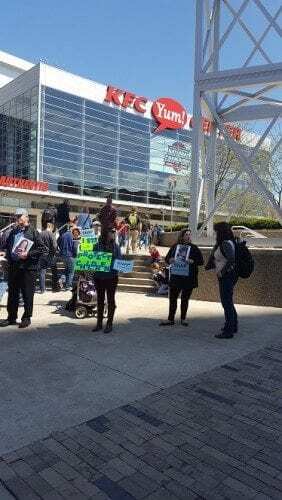 Most T4G attendees didn’t pay any attention to the protesters; however, around 10 of them paused long enough to listen to the dissenters. One of those standing with the SGM victims lifted his voice and said: “We are protesting one of the main speakers. Do you want to know who?” Some standing in line had no idea. One woman in the crowd yelled: “It’s all lies!” and two young guys chanted: “We love CJ, We love CJ” as they passed by. I quoted the parable of the Good Samaritan at the top of this article. Before we go trashing the Roman Catholic Pope it may be wise to reflect on whom more closely demonstrates the heart of the Good Samaritan, the heart of Christ – the T4G celebrity Christians, or Pope Francis. Finally, here is the voice recording and transcript of Mohler’s introduction of C.J. Mahaney. I cannot determine Mohler’s intent in making this statement. It was in very poor taste, something unbecoming the President of SBTS. I am left to wonder if perhaps the Southern Baptists are no longer drinking grape juice for communion? Was it an attempt to portray information garnered from Googling the internet as frivolous and untrue? 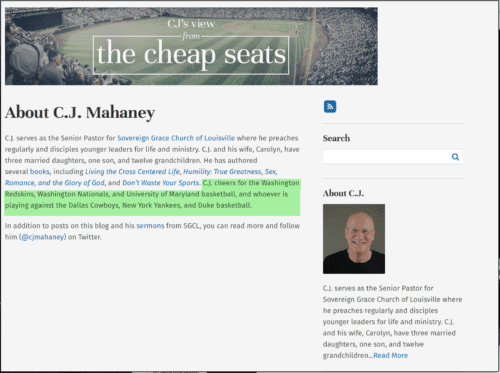 When Mohler sarcastically stated that “I now know it to be true because I read it about C.J.” was he aware the source of the trivial information he discovered was none other than the Humble One’s own blog? As I stated earlier, the whole thing is rather bizarre, but then, so is C.J. Mahaney. I doubt that Mohler actually Googled Mahaney. If he had, one of the first articles to come for the term “C.J. Mahaney” is an article on this blog. I know this because I’ve done several Google search “tests” to determine that Thou Art The Man’s article consistently comes up on the first one or two pages for the term “C.J. Mahaney.” In addition, the relevant post is by far the most popular one on this site despite the fact that it is almost never put on Facebook feeds or promoted in any way by individuals. Update: I just cleared my browser’s history and went into Google’s incognito mode. Six out of the first nine references to “C.J. Mahaney,” with or without the quotation marks around that term, referred to the sexual abuse scandal he’s a part of. After Dever’s tweet, Mahaney’s tweets and sermons at @sgclouisville take on a particular focus, beginning Aug. 26, 2015 when CJ begins tweeting Jodi Eareckson Tara quotes, followed that same day by the announcement Sovereign Grace Music would be dropping a new album on Sept 30. Bob Kauflin’s Twitter feed also starts lighting up products and promotions. Mahaney also starts tweeting Sinclair Ferguson quotes like a man obsessed. Ferguson, at that time, was getting ready to publish a new book with content that would coincide nicely with the theme of the conference. Was Mahaney attempting to court Ferguson’s appearance at T4G16 where he could sell his new book? Then, on Sept. 18, 2015, ten days after Mohler announces T4G16 registration is open, and seven months before the conference begins, Mahaney tweets, “Why Job?” Why indeed. 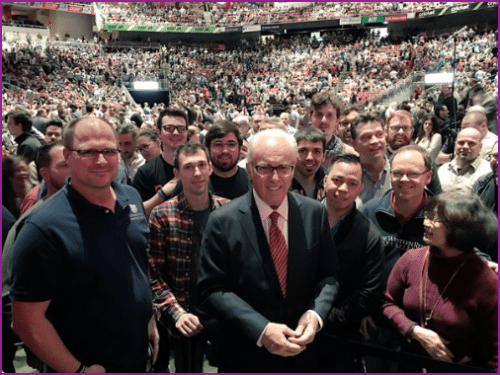 And from that point on, Mahaney tweets 77 more times about Job, and he launches a sermon on Job at for his little congregation, rarely looking out at them while preaching, as he test-drives his T4G16 material on them because he has a much larger audience in mind. What a shock to discover that Mahaney’s assignment for T4G was to preach on Job. I thought being a pastor meant laying your life down for the sheep, feeding their unique needs, not using them to sell yourself to a larger audience. That’s some gift CJ’s got, Todd, but I think we agree it’s not heavenly in origin (James 3:14-15). I don’t think that comments get much better than this one, folks. 😉 I’m glad that Paula is on our team! You are welcome. Thanks for reading Melody! Have you ever considered their Calvinism doctrine could be in error? Start reading “Paul’s Passing Thoughts” and you will be enlightened about their doctrine. Yes, I have. My views have actually changed over the past several years. Maybe “softened” would be a good word, or more compassionate (I hope). I have seen, even experienced, way too much damage from the Calvinists who exalt doctrine over love. I will check out the book you mentioned, thanks. Thanks, Christian. I am familiar with the blog you mention, although I have not read it in some time. My answer is that I don’t think that Calvinism, which can have its downsides, has anything to do with Covenant Life Church’s problems with abuse for a few reasons. 1) Covenant Life Church only claimed to adopt Calvinist doctrine about 15 years ago and was covering up child sexual abuse prior to saying it was part of the co-called Neo-Calvinist movement. 2) Covenant Life Church has never been motivated by doctrinal purity. They change their doctrine whenever it suits them to do so. Namely, if there’s an alliance they wish to form with a group that has a different doctrine, they just incorporate it into their schtick. 3) Covenant Life’s founders were not Calvinists. They actually had Roman Catholic backgrounds. I will conclude this comment by saying that extreme Calvinism can cause a lot of misery but I don’t think it’s behind Covenant Life Church’s fundamental problems with abusing its members in many ways. Also, I have a true Reformed lineage so am sensitive to criticism of Calvinism, on some levels. My Reformed background can be traced with great precision to Germany 300 years ago and chances are that some of my forebears were burned at the stake as Protestant heretics. In other words, Calvinism may have its problems but it has not traditionally produced the chickens like Al Mohler and C.J. Mahaney who are presently claiming to be part of the so-called “Neo-Calvinist Movement,” which I think is just a marketing ploy they developed 15 years ago to sell their non-sense. Todd, the author of that book runs the blog Christian referenced. Thanks. Yeah, got it, thanks Janna. This should be an enlightening sermon with regards to certain CJ-supporting Tweets. Fullerton is preaching tomorrow on 1 Tim 3:1-7. Burleson, Wade (2016-04-16). Fraudulent Authority: Pastors Who Seek to Rule Over Others (Kindle Locations 245-249). Istoria Ministries. Kindle Edition. Burleson, Wade (2016-04-16). Fraudulent Authority: Pastors Who Seek to Rule Over Others (Kindle Locations 256-267). Istoria Ministries. Kindle Edition. Hey Buddy!, I found this information for you: "Mahaney Rejoins Fellow Celebrities on T4G Stage, No Acknowledgment of Abuse Victims". Here is the website link: https://thouarttheman.org/2016/04/16/mahaney-rejoins-fellow-celebrities-t4g-stage-no-acknowledgment-abuse-victims/. Thank you.